James Cohan is pleased to open Certain Skins, an exhibition of works by Graham Anderson, Sadie Benning, Sara Greenberger Rafferty, and Byron Kim. The exhibition opens Wednesday, June 29 and will be on view through September 11 at the gallery's Lower East Side location. The works collected in this exhibition explore the role materials may play in the construction of images. 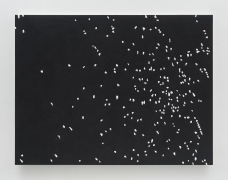 Utilizing a range of invented and hybrid processes that underscore the mutability between surface and image, the featured works incorporate elements of painting, sculpture, drawing, and photography into novel material states that embody rather than depict images. 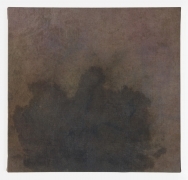 Byron Kim stains his recent paintings with natural dyes and then works them with oil and earth pigments on a variety of fabric including canvas, linen, muslin, burlap and silk. The physical nature of the fabric - its absorbency, texture, thickness, strength, transparency and color - informs the process which evolves as the painting develops. Kim became interested in bruises upon encountering a passage in a poem by Carl Phillips about his sleeping lover’s bruise illuminated by dawn’s light. Phillips describes the bruise “lifting itself over time from the darker/ blues to, slowly, something like amber/ to at last whatever, before the wounding/ the flesh was.” Kim recognizes the bruise with or without the context of flesh as a perfectly rich subject, something he would like to imagine and to bring into the world as a metaphor. Sara Greenberger Rafferty’s new five panel work is comprised of photographic prints, hand-cut Plexiglas, and paint. 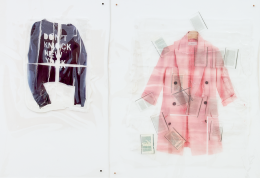 Here, Rafferty comfortably plays with the slippage between image and surface in photo-objects of garments, as well as found and re-formatted texts. Like shedding one’s skin, the garments and text are open to the viewer to be refitted and tried, waiting for the body to activate them. 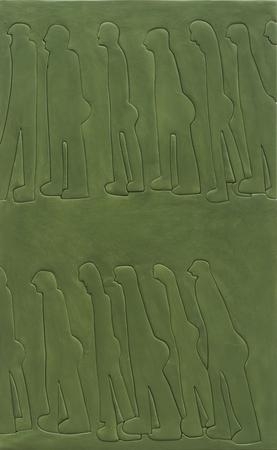 Sadie Benning’s materially ambiguous constructions are often described as paintings, but such distinctions feel artificial. Equally indebted to drawing as to sculpture, Benning’s constructions are made of jigsaw cut pieces of wood that have been hand contoured, coated in resin and fit back together into puzzle-like compositions. In a trio of works, Benning demonstrates the way she uses these conjoined surfaces to create the site on which to explore the breakdown of forms into even smaller forms. In Services, two rows of figures stand in profile waiting in queues; in another red monochrome work, thin lines efficiently shape the form of a meat grinder at work, and a third composition depicts an exploded field of raw material that stretches across the surface like confetti; matter ultimately reduced to its simplest element of individual pixels. 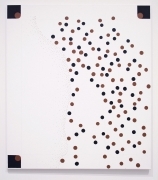 Pointillist canvases by Graham Anderson dissolve figure and ground into flattened, synthetic illusions. Founded on the elusive ability to locate and hold together identity, each figure is outlined and defined, but its borders are tenuous and permeable. The marks Anderson create become their own discreet entities whose presence is always left recorded; some becoming decorative elements, while others amass into optically charged fields causing the viewer’s perception of the image to change. As this perception shifts, the composition continuously recalibrates and reformulates itself into a dot matrix of varying skin tones that speaks as much to the resilience of collective memory as to its waning.